Kukis are known by different names to different communities. Some called them Lushai, some called them Kukis, Darlongs, Rokhums and among the Burma boarder they are known as Chins. They called themselves Hare-ems. However ‘Kuki’ has been accepted as the generic name for the community. As per 2011 Census all together Kukis are 10,965 persons in Tripura. 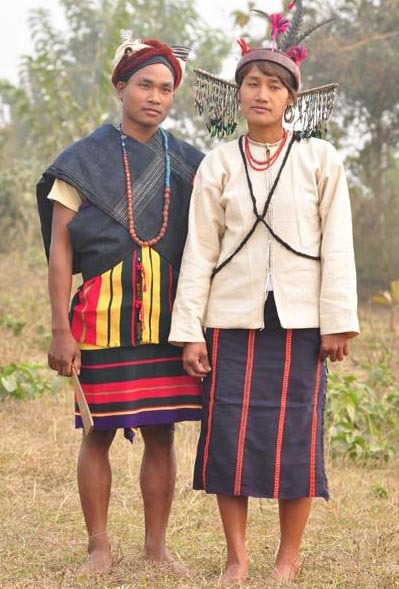 In the past they lived in hill top and maintain their livelihood through jhum cultivation and also by producing fruits. Now-a-days they do plain land cultivation and rear livestock. Linguistically they speak a language which is closely related to Kuki-Chin linguistic family of Sino-Tibetan race.The Kukis have many clans and sub-clans. Kukis are fond of music and dance. They work hard in Jhum field, garden and enjoy dance and music at community level. Normally they do not arrange any marriage alliance outside their community. Traditionally they were not Christian but animist and worship different deities and spirits. But for the last 90(ninety) years majority of them have embraced Christianity as their religion. They have their own customary laws and village council. LAL is a term to denote village chief. This is the reason for which Darlong use Lal before their name. The village chief generally looks up all sort of social and religious disputes Including dispute related to marriage and divorce. Presently Kukis are socioeconomically advanced then other tribes.